It was a fictional foe Fort Drum soldiers faced in a live-fire exercise Tuesday -- unless you count the weather. 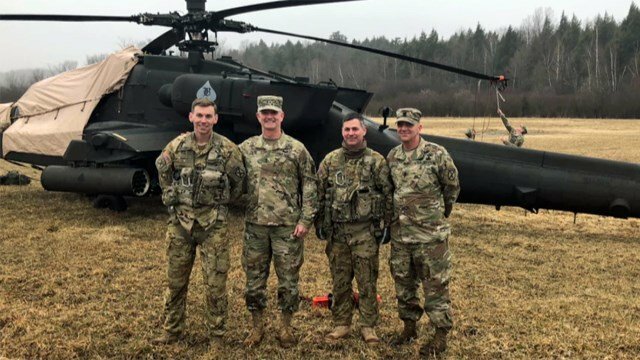 Helicopters were grounded when heavy rains and thunderstorms rolled through during the 10th Mountain Division's Operation Summit Strike exercise. One Apache chopper made a pit stop and landed in a farm field in Spragueville owned by the Platt family. Military officials say the Platts were more than welcoming. Maj. Gen. Walter Piatt stopped by to thank the Platts for allowing the chopper to wait out the rough weather. The photos are from Fort Drum's Facebook page.